At Jamieson Equipment Company, we offer ladders and work platforms for use where safe climbing, crossing, and working is required. With a variety of options including custom finishes, hand rails, steps, and rungs, OSHA design safety cages, security gates and ladder guards, safety chain, etc., we have a ladder or work platform to fit your needs! 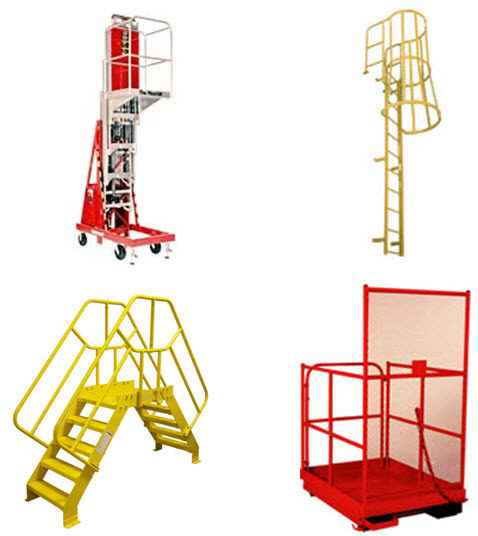 We offer Welded Steel Dock Ladders, Fixed Steel Ladders, Heavy Duty Crossover Bridges, Portable Crossover Platforms, Standoff Landing Platforms, Overhead Work Platforms for Forklifts, Portable Push-around Lift Work Platforms / Manual Winch Elevating Work Platforms, and Portable Electro/Hydraulic Elevating Ground Entry Work Platforms. Whether you need to climb up the outside of a silo, inspect products moving along your conveyor system, or safely change light bulbs at your facility, we are the Complete Solution! Your safety is always on our minds! Check out the National Safety Council Fixed Ladder Data Sheet. Visit our online catalog to find out more about ladders and work platforms. This entry was posted in Uncategorized and tagged climb, custom finishes, fixed steel ladders, forklift, hand rails, heavy duty crossover bridges, inspect, ladder guards, ladders, manual winch elevating work platforms, OSHA, overhead work platforms, portable crossover platforms, portable electro/hydraulic elevating groun entry work platforms, portable push-around lift work platforms, rungs, safe climbing, safety cages, safety chain, security gates, silo, standoff landing platforms, steps, welded steel dock ladders, work platforms. Bookmark the permalink.